Note: This photo-filled blog is best viewed on the blog site. If you are not viewing it there. simply click on the title. As always, if you think of someone who would enjoy this, please pass it along. My goal in the On the Road series is to share with you the joy of discovery that comes from a little intentional wandering. By intentional wandering, I mean doing a little research to establish a few destinations and using this as a starting place to wander. It’s neither aimless wandering nor is the destination the singular purpose. Put another way, it purposeful meandering. The idea is to look left and right and not just straight ahead. Of course, most of my focus will be on food with an occasional non-food observation. This summer I plan to visit area farm stands and farmers markets. As with all that I do on this blog, it is my hope that what I share will lead you to more home entertaining. First, a few definitions. 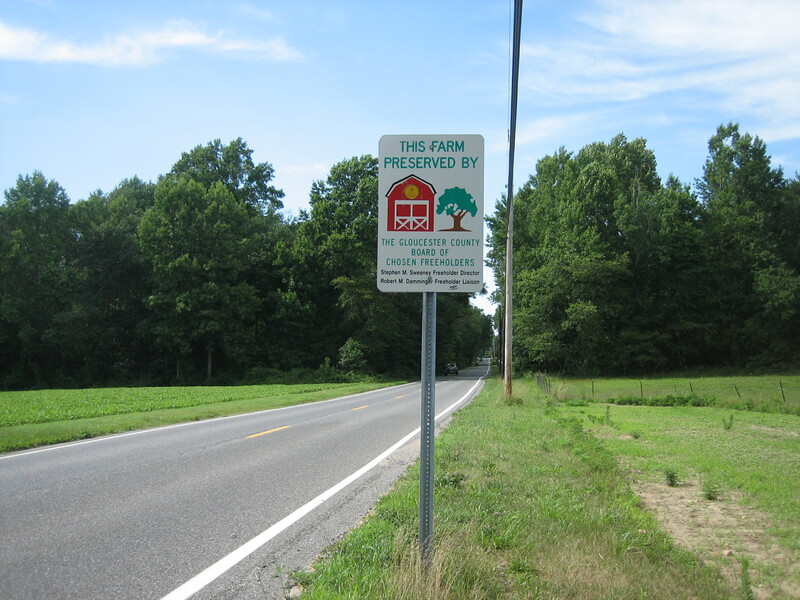 A Farm Stand is located at a farm and is essentially a rural entity. 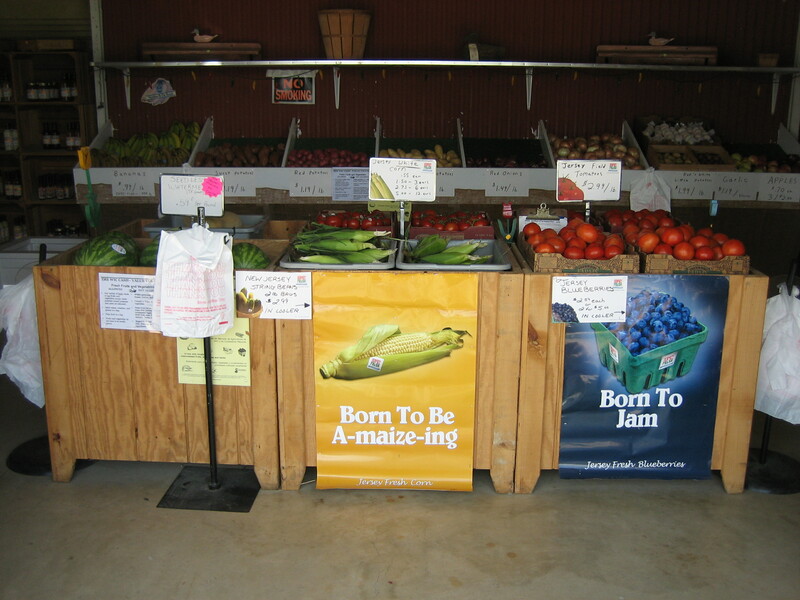 Farm stands ideally sell only products from that farm or neighboring farms. 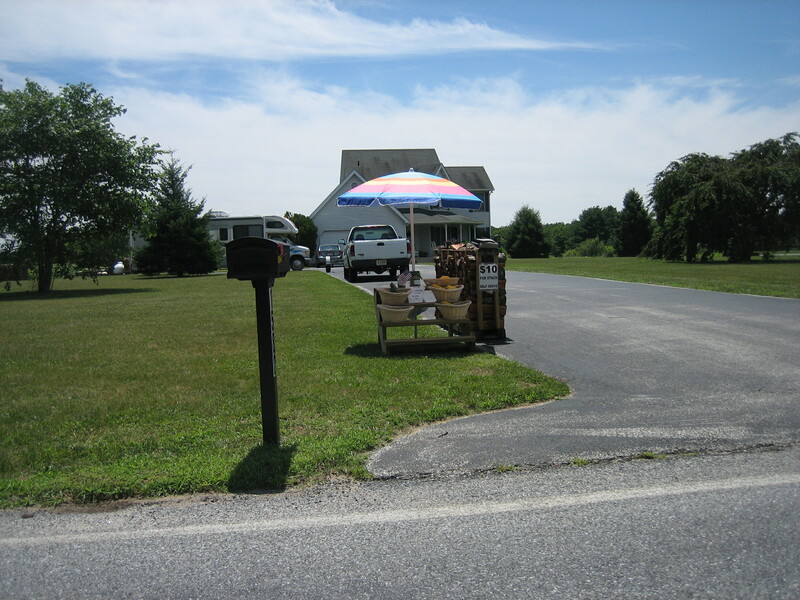 A variation is a roadside stand that sells local produce from area farmers — though not attached to any particular farm. 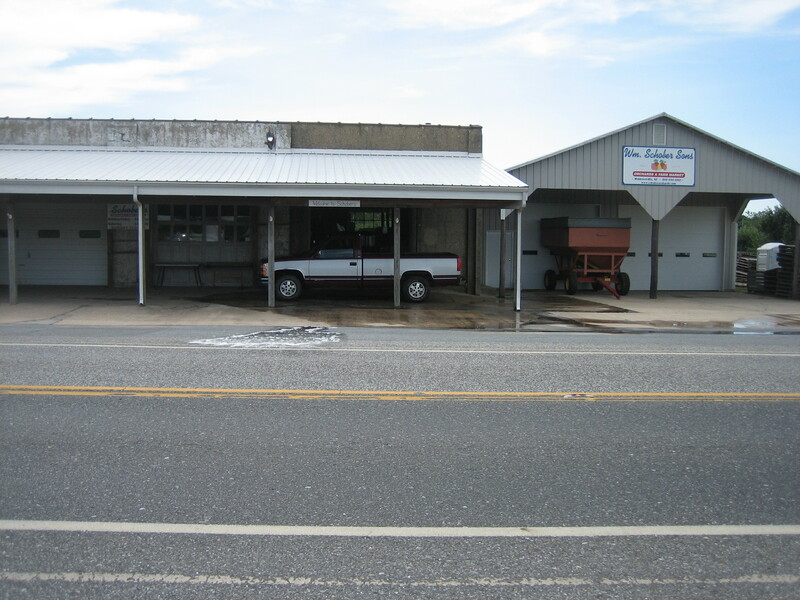 Inevitably, stands sell products brought in from far-away — like the Texas watermelons offered by one Salem County stand, to augment their sales and provide shoppers convenience. It should always be clear to the shopper what is “Our Own” and “Local.” On the other hand, Farmers Markets provide an urban outpost to a collection of area farmers. They are typically manned by the farmers (or their mothers, fathers, sisters and brothers) and sell products just harvested from their farms. Farmers Markets often are mini-malls selling related like products like fresh baked bread and pies. Why shop at farm stands and Farmers Markets? Why shop at farm stands or Farmers Markets? As I have said before, cooking that’s sensitive to seasonal changes is a way of staying connected to your particular place in the world. And cooking starts with shopping. Food shopping can be an enjoyable leisure activity and not always just a task for which your only satisfaction is crossing out things on a list until you’re done. Fresh produce is a thing of beauty. At a minimum, farm stands and farmers market products are far fresher than similar products you can find in the supermarket. Fresher usually means tastier. Ideally, you occasionally find products that you just don’t see in supermarkets — like the large bunch of dill weed that I purchased to go with the huge $3 basket of Kirby cukes. Though my Kirby cuke purchase was a good buy, in general, low price is not why you go to these markets. Finally, there is something “life affirming” in buying directly from farmers and, in so doing, supporting their efforts. 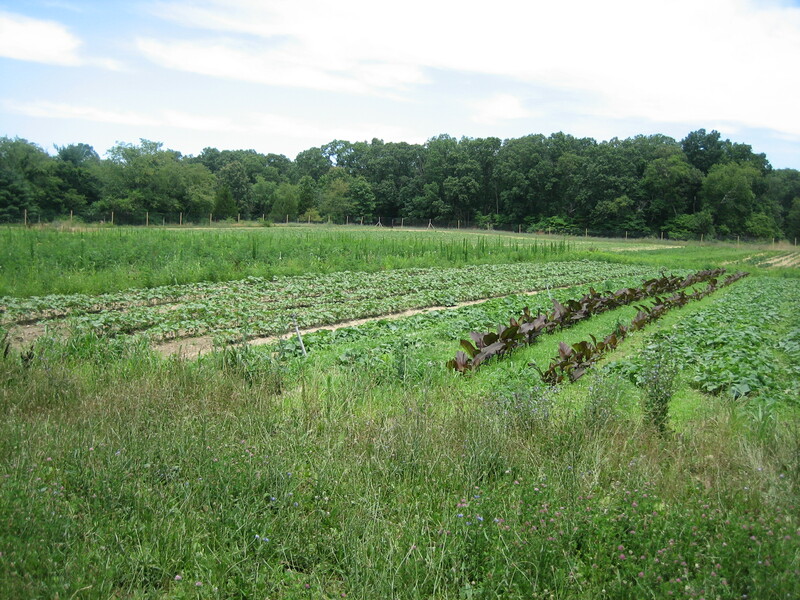 A world with small local farms is simply a better world. Think of your purchases as a delicious way to help preserve an endangered species. My trip plan began with modest internet research. 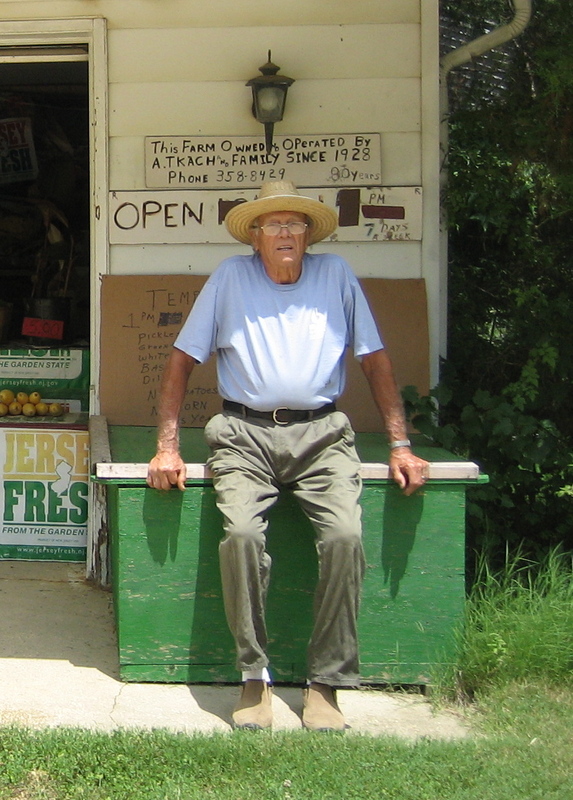 “Farm stands” –” roadside farm stands” — “farmers markets” and “Salem County, NJ” brought me to several websites. 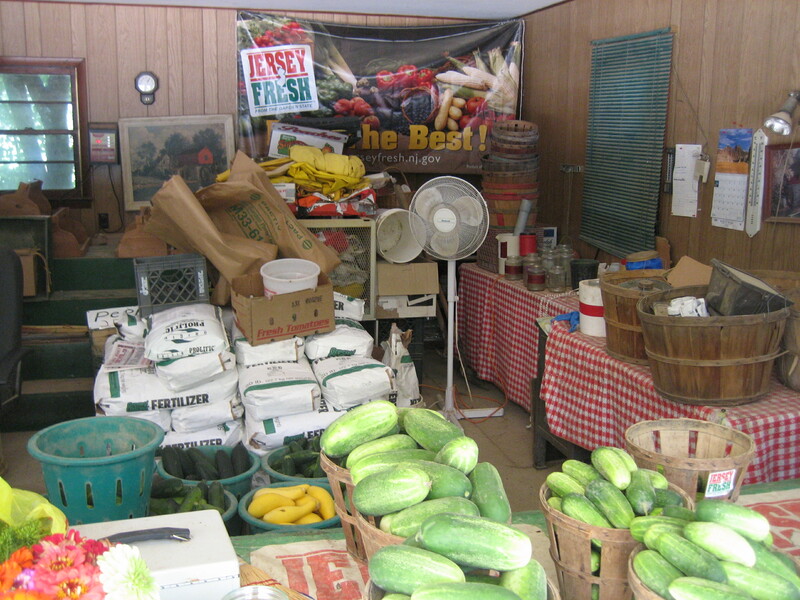 Though I have appealed for suggestions of farm stands on this blog, no one had offered any in this South Jersey area. And off I went one glorious morning last week. 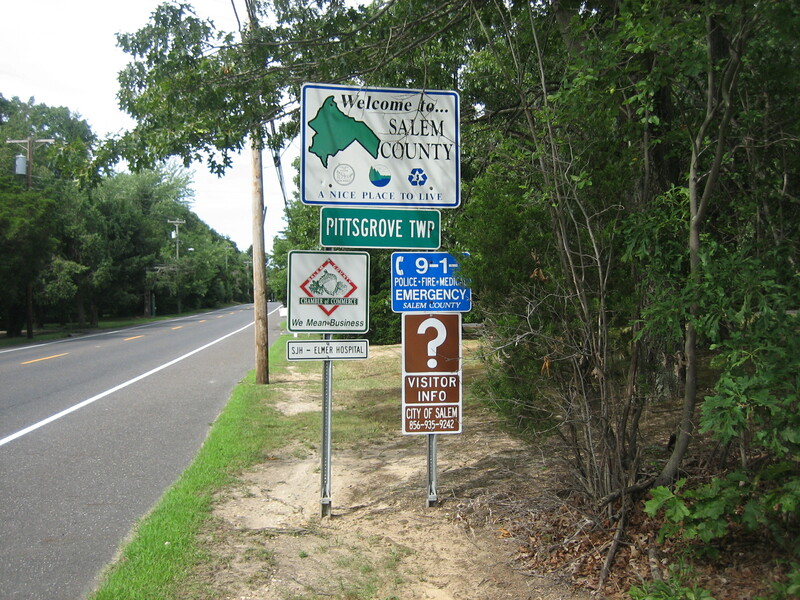 Salem County is quintessential South Jersey, located in the southwest corner of the state along the Delaware Bay just below Gloucester County and across from New Castle County, Delaware. It’s flat and forested, punctuated by broad expanses of fields, modest farm houses and country residences with above ground pools and clothes hanging on the line to dry in the summer sun. Per capita income is modest at $20,874 Total population of Salem County is about 68,000. 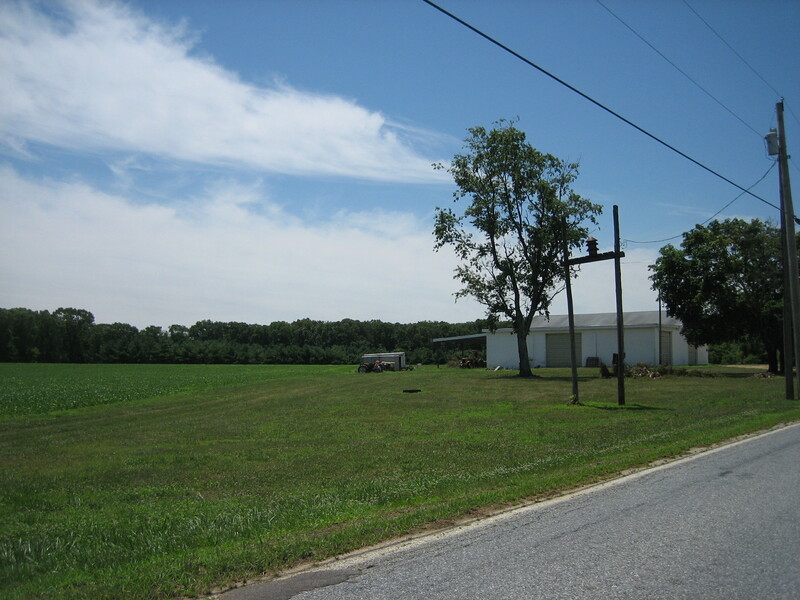 While not all roads lead to Pittsgrove Township, there did seem to be a cluster of farm stands around there. 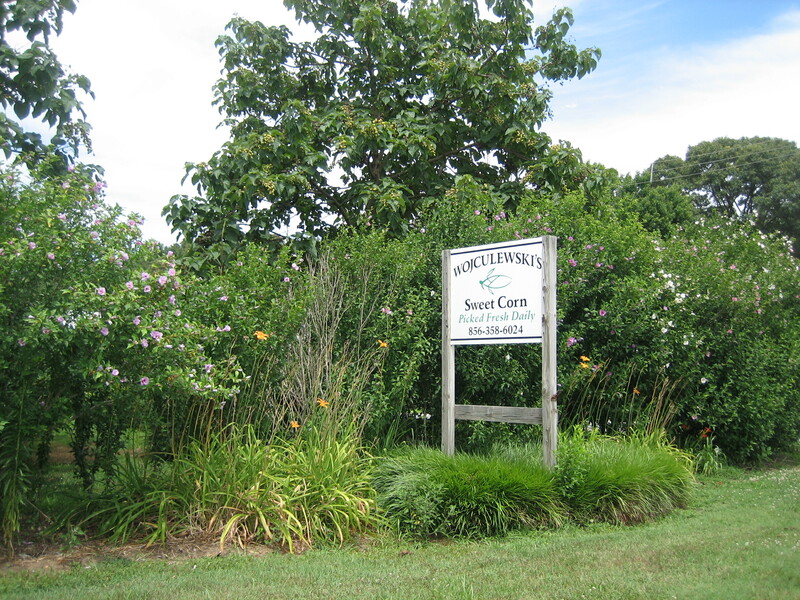 So, it was off to Pittsgrove — about a 45 minute drive from my Center City home. On a rare cool summer day with cloudless blue skies, signs of faith and a faded past stand out against a backdrop of lush fields of corn and soybeans. 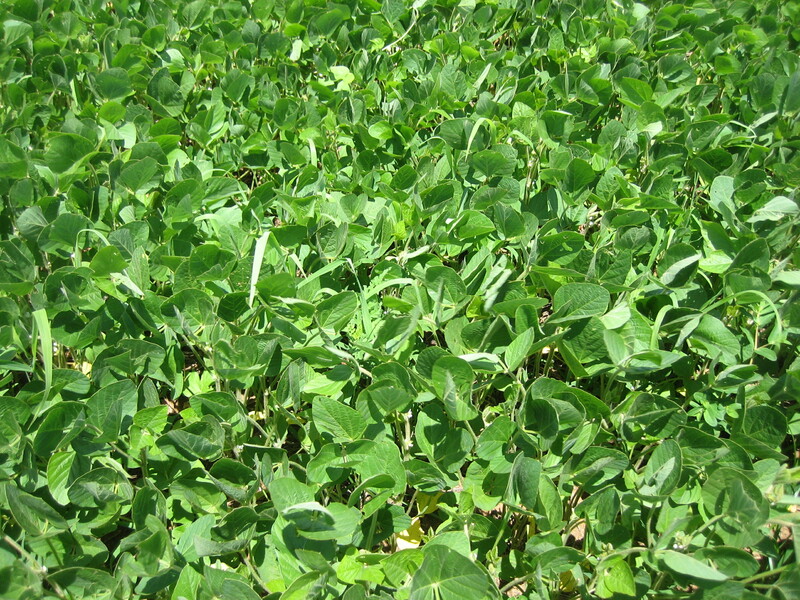 These are soybeans, grown for processing and not likely destined for your local Japanese restaurant. It soon became clear that my little trip offered more than simply peaches and tomatoes. Though Salem County would hardly make any Ten Most Beautiful Counties in the Unities States list, beauty was abundant if one simply bothered to look around. A colt grazing with its mother. Certainly not horse country, but horses none the less. Horses of assorted sizes and shapes. Curiosity meets curiosity. If you get out of the car, you can get up close and personal. Sometimes curiosity is best served from inside the car. 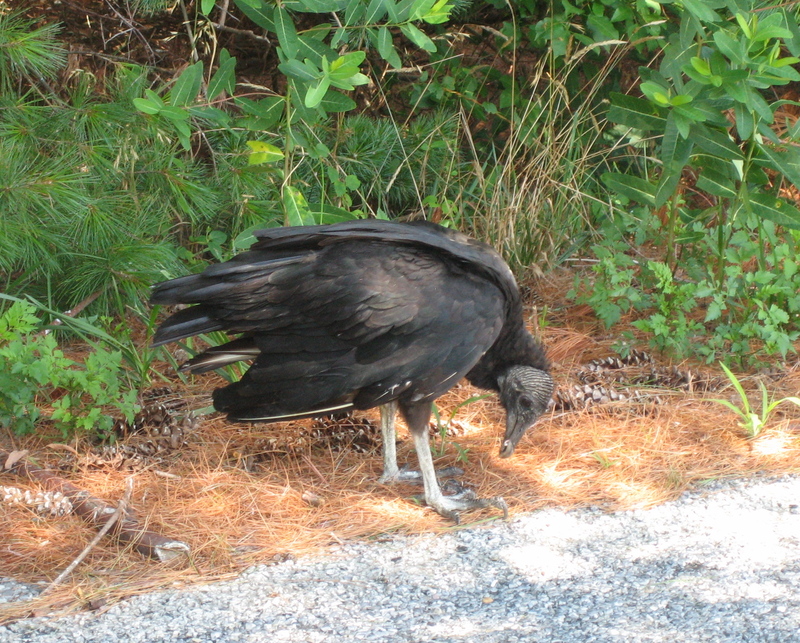 Here is a turkey vulture having lunch by the side of the road. Walkers Farm Market was my first stop for no good reason except that I put it first on my list. I made no effort to line up my destinations in any rational sequence. As a result, I occasionally backtracked over the same roads, but they never looked just the same twice. I always noticed different things. 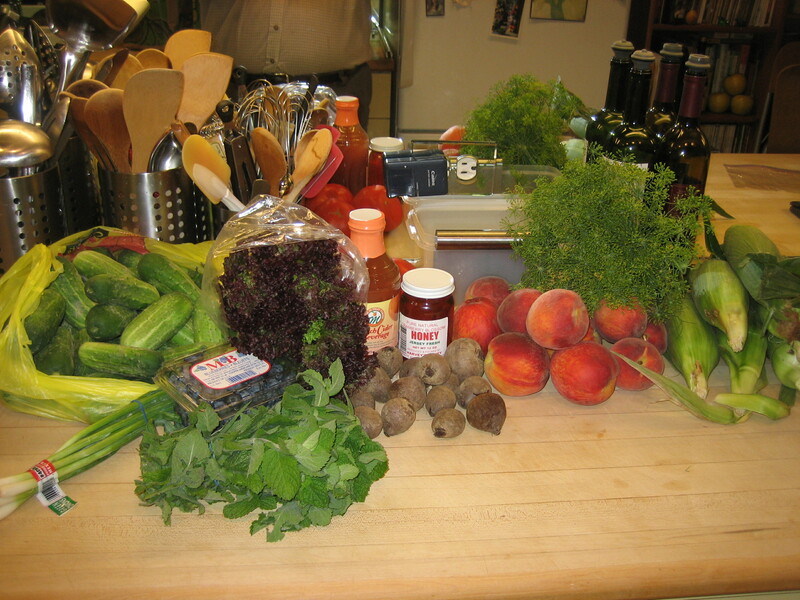 In season at Walkers modest stand were Jersey peaches, tomatoes, string beans and blueberries. It was not clear which of these were actually grown by the Walkers. The watermelons were from Texas. Assuming there was a Farmer Walker, it seemed to be his teenage daughter holding down the stand. As each trip and associated blog will feature a recipe, I began wondering what the recipe would be for this blog. 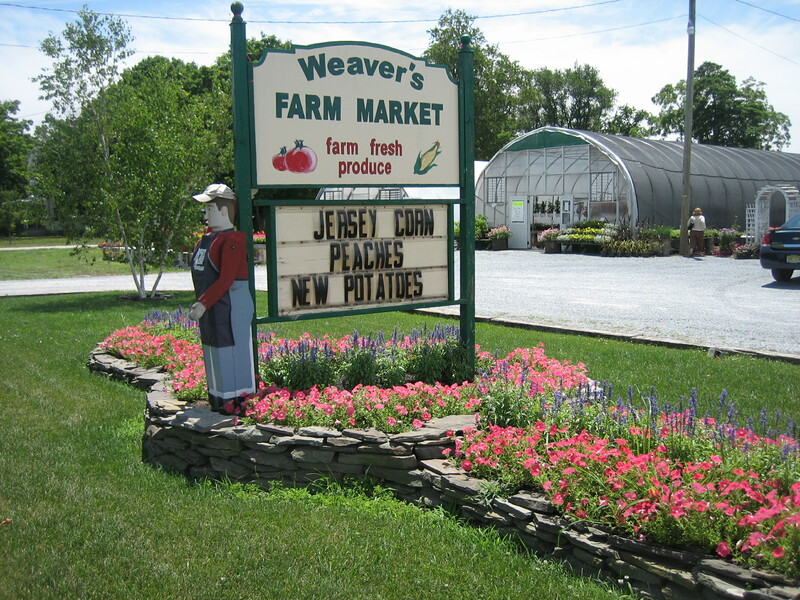 Weaver’s Farm Market was next on my list. More substantial than Walker’s, the stand included a “garden center” with greenhouses filled with annuals as well a a broad selection of farm-raised produce, carefully signed as “Jersey Fresh” — meaning farm grown and local , and items marked “Our Own.” Weaver’s was neatly ordered and run by what I assume were the Mennonite farmer’s wife and daughter. 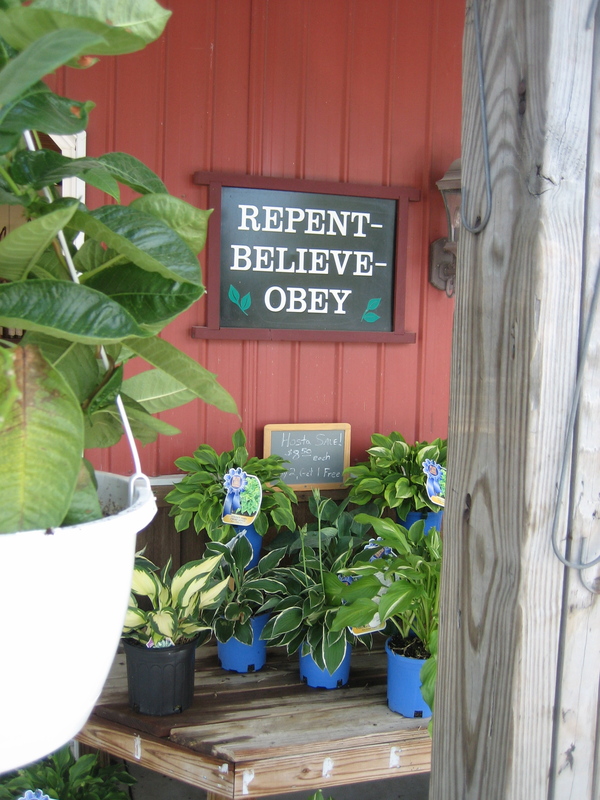 In addition to fresh produce, one sign expressed: We appreciate our customers being modestly attired. Another provided a prescription for a good life. Lovely small beets and a big fat bunch of apple mint caught my eye. These are the sorts of things I like to find at farm stands — things I am not going to find in my local supermarket. Though Maple Acres has had corn from their fields for several weeks, there was little Jersey corn on my pre-July 4th trip. Wojculewski’s specialized in corn. No corn, no Wojculewski’s. This is not precious organic farming country. The parched field in the foreground is the result of weed killing chemicals and not the parching sun. Fields are “cleared” this way, then plowed and re-planted. In the background, adjacent to the woods is a lush green field. 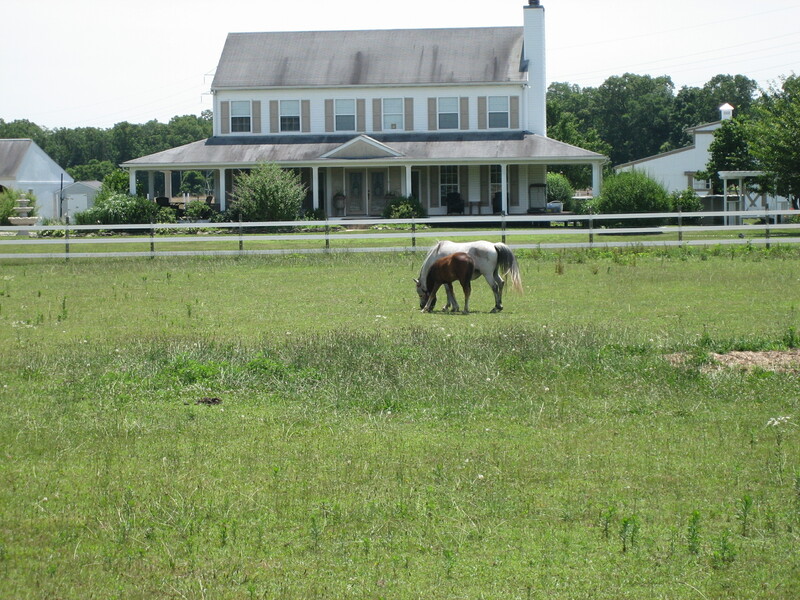 Only occasionally farms have given way to housing developments as the country yields to echoes of the suburbs. As urban roads make way for bikes, these country roads make way for tractors. In the background sits a wide bank of solar panels to help cope with future energy challenges. 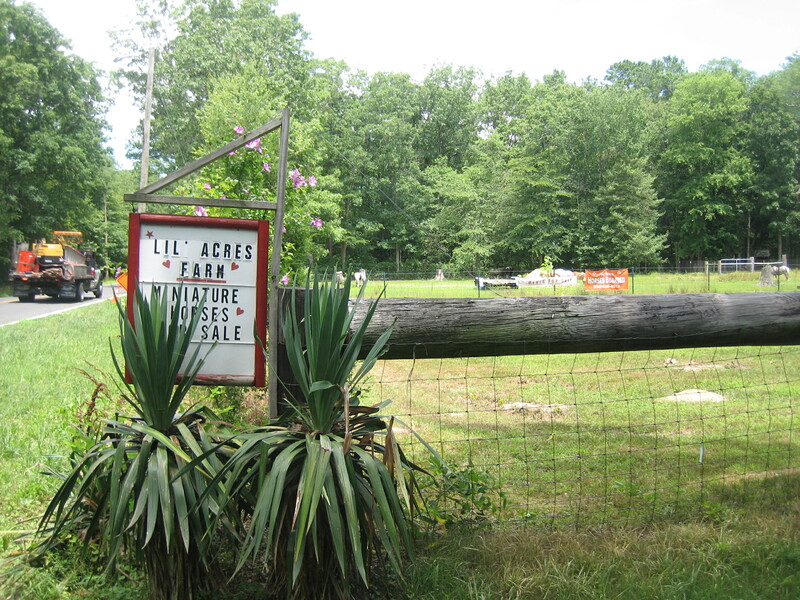 As communities develop ways to support and preserve pastures and farmland. Both private and public. 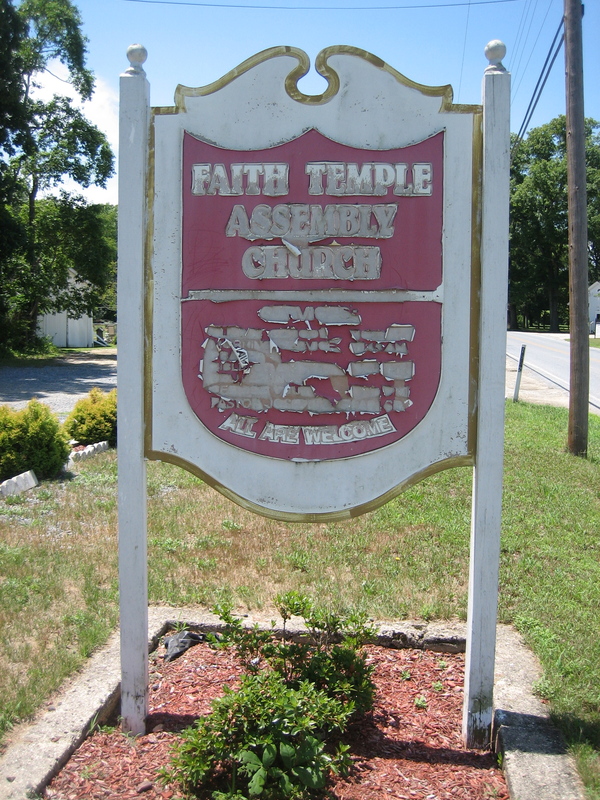 A “Chosen Freeholder” is an elected representative, here in Gloucester County, north of Salem. The wonderful thing about discovery is that when you set-out, you never know what it is that you will discover. The highlight of my trip was meeting Mr. Tkach of Tkach’s Farm. Mr. Tkach is 80 years old. 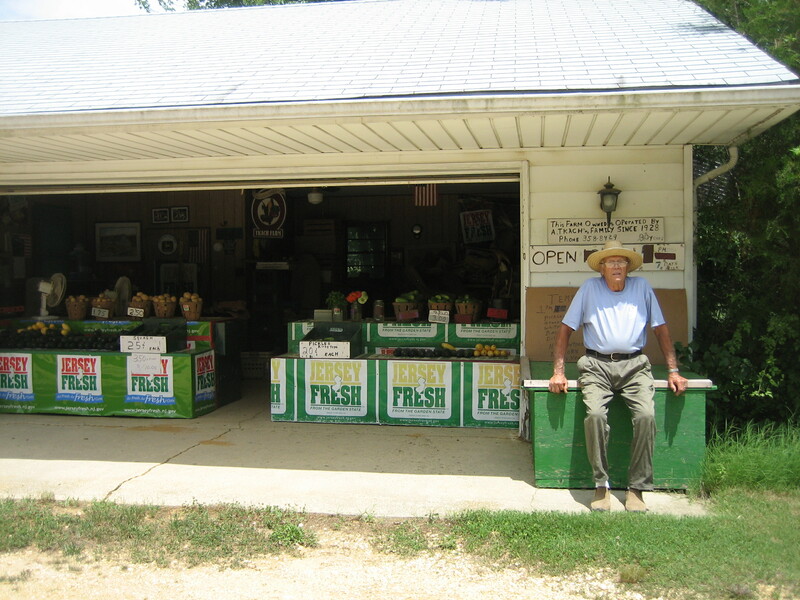 He was born two years after the farm was established in 1928. At the age of five he began working with his father. He recounted that as a teenager he and his father would take the cart up the road to what was then a German Prisoner of War Camp — Rommel’s Afrika Korps, according to Mr. Tkach, to fetch the garbage to bring back to the farm to feed the pigs. The woods across the road from his farm stand have long-since reclaimed the POW site, but he assured me that the concrete base of the guard tower remains. He told of how the POW’s would play soccer all day and when the ball got kicked over the fence, he’d just toss it back. This is his field. 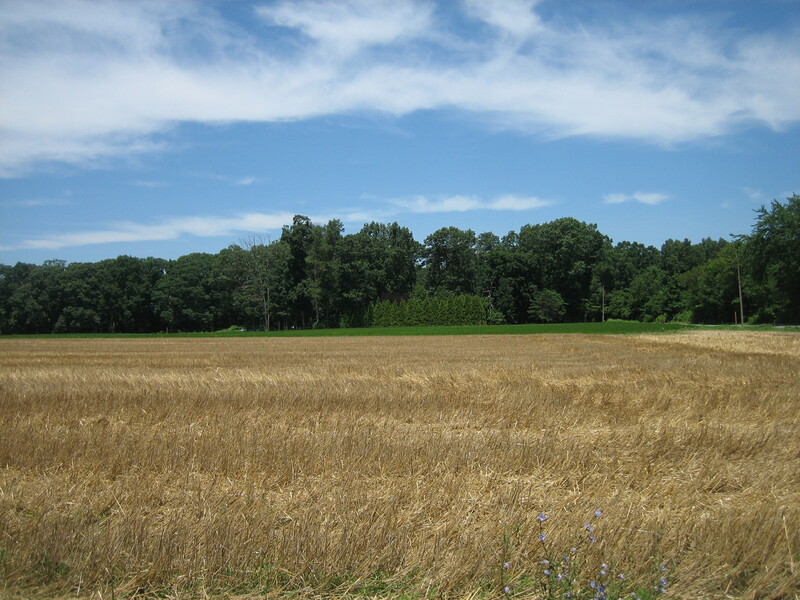 To the right — out of the photograph — is an expansive field of dill weed. To the far left are okra plants. 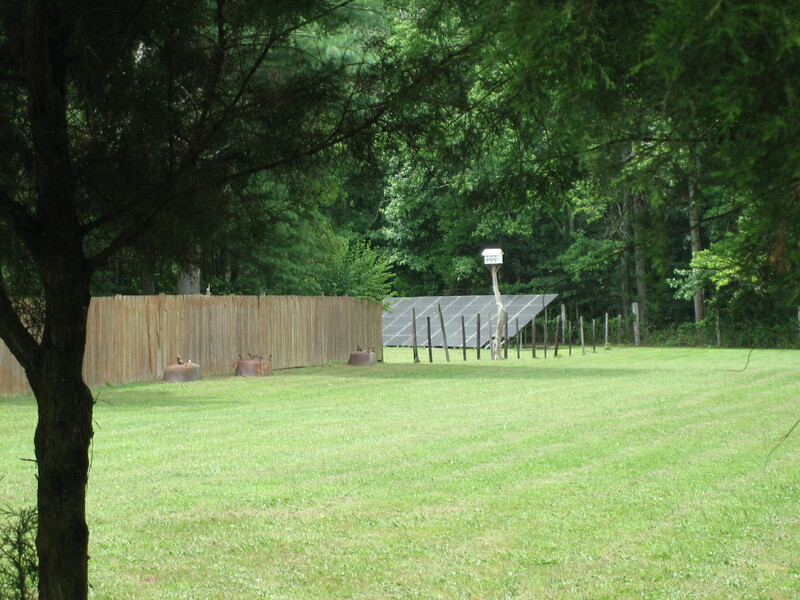 Surrounding the field is a new fence. It cost $6,000 with 1/3 paid for by New Jersey, 1/3 paid for by a government farm program and 1/3 paid for by Mr. Tkach. 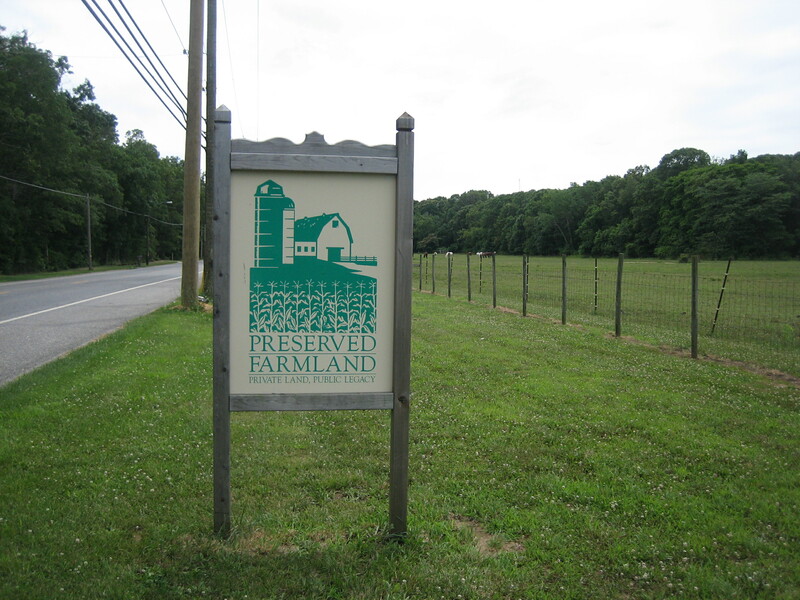 It’s another example of the community commitment to maintain small family farms — though as he pointed out, the same program is available to New Jersey agribusiness. It’s not fancy, but it’s fresh. And what caught my eye was the basket of beautiful Kirby cucumbers on the right — the entire basket for $3 and the generous bunch of dill weed for $1.50, already bagged for me in the the yellow bag, partially obscured to the left. I know I did a cucumber recipe for my Maple Acres blog so I couldn’t do that again, but I do love pickles and thought maybe I’d make a batch and share an additional cucumber recipe. It was at Wm. Schober Sons, that I discovered Peach Cider. The facility wasn’t cozy looking as I assume that most of their efforts went into more commercial distribution of their products. 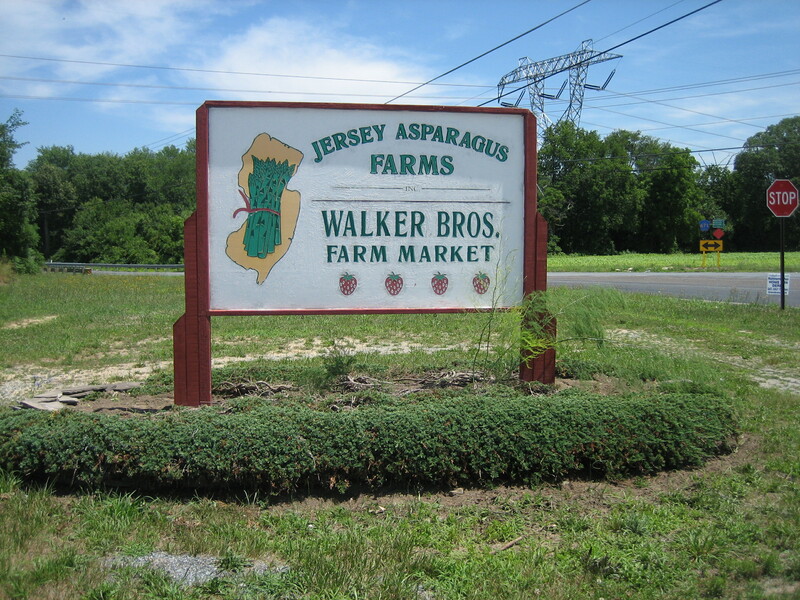 The cider came from “Jersey Fresh” Circle M Fruit Farms. It’s not exactly fresh crushed apple cider for peach enthusiasts. It is pasteurized and contains “peaches, sugar, water, all natural peach flavorings, and erythorbic acid to promote color retention.” I never knew peach cider existed and it’s delicious in a somewhat processed way and benefited from a squeeze of lime and a little seltzer — a peach spritzer. 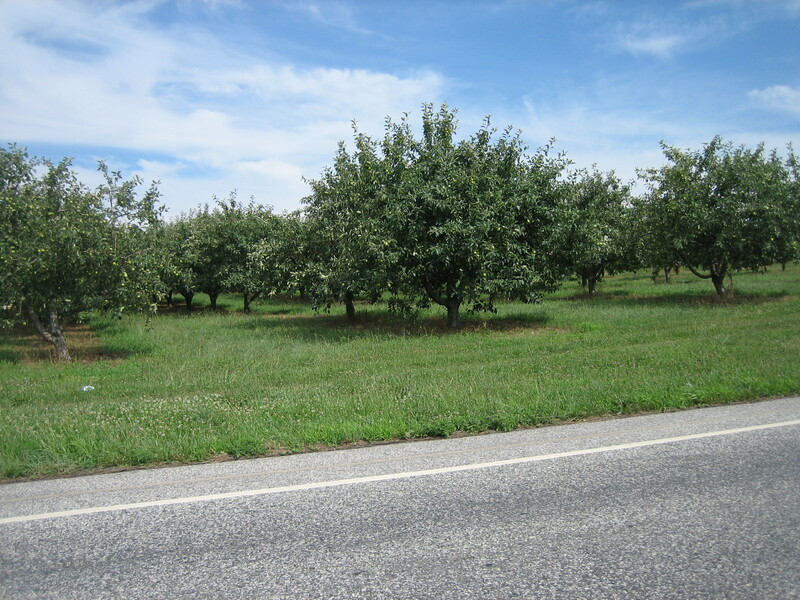 Salem’s landscape includes orchards like Schober’s. 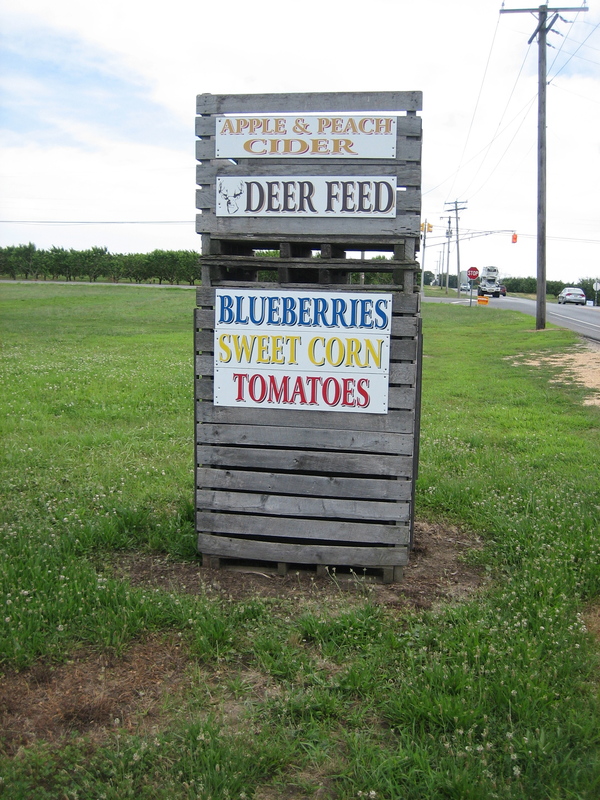 You could do a nice little book just of just New Jersey farm stand signs — here across the road from Schober’s. 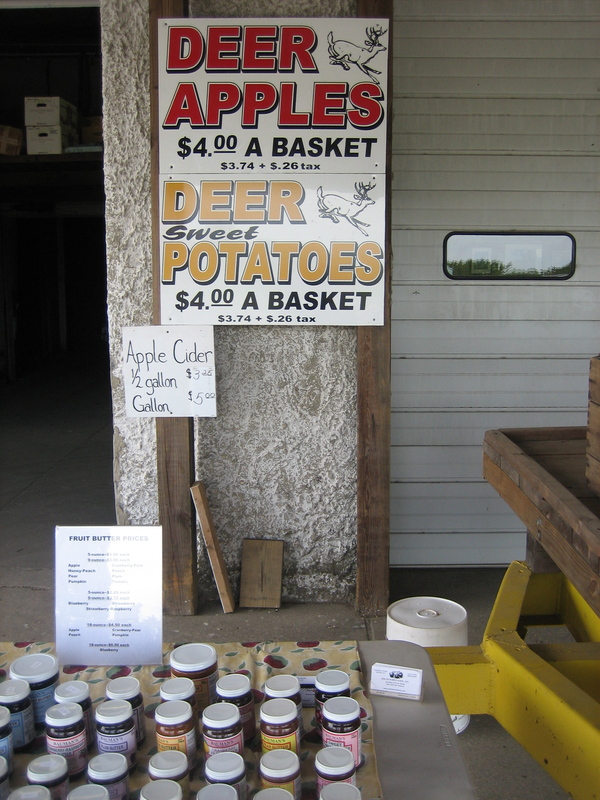 Deer Apples and Deer Sweet Potatoes are meant to feed deer — and, my guess, a form of “deer bait” for hunters. 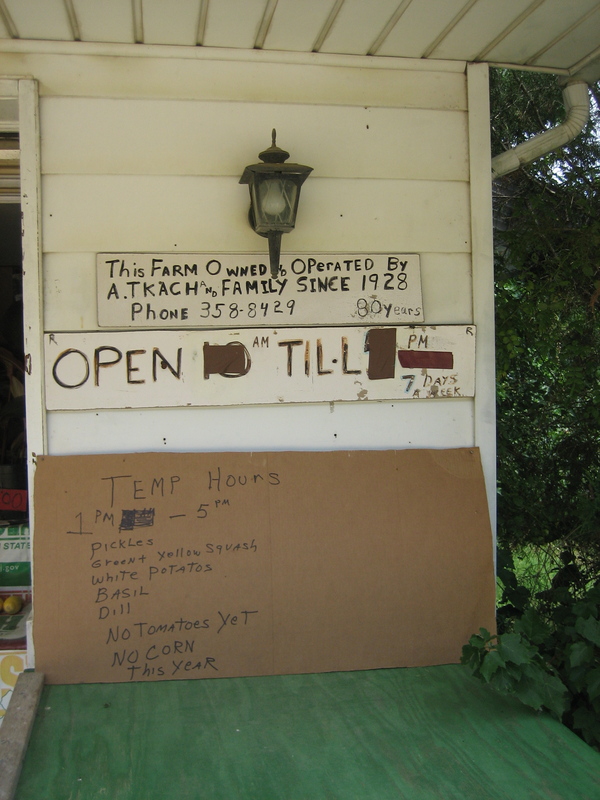 Along the road backyard farmers pick-up a little extra income with “honor system” stands. Given that it’s peach season in Salem County, peaches ended up as my ingredient of choice for this week’s recipe. Early season peaches are “cling,” meaning that the flesh clings to the pit. The cling varieties are distinct from “freestones” that begin to arrive in Jersey orchards in August. The flesh of a “freestone” peach separates easily from the pit and so lends itself to recipes requiring attractive peach halves or slices. To remove the flesh from the stone of a cling peach you need to just slice in away with a sharp paring knife. While a pretty peach half from a freestone is perfect for poaching or grilling, cling peach pieces work in things like cobblers, chutneys and butters. The recipe that will accompany this blog will be for Fragrant Peach Butter — published tomorrow. I am new to the wonders of GPS Navigation Systems. Much to my surprise and delight, there is a setting that provides a route that avoids highways. In keeping with the spirit of my journey, heading home on back roads seemed the consistent path. 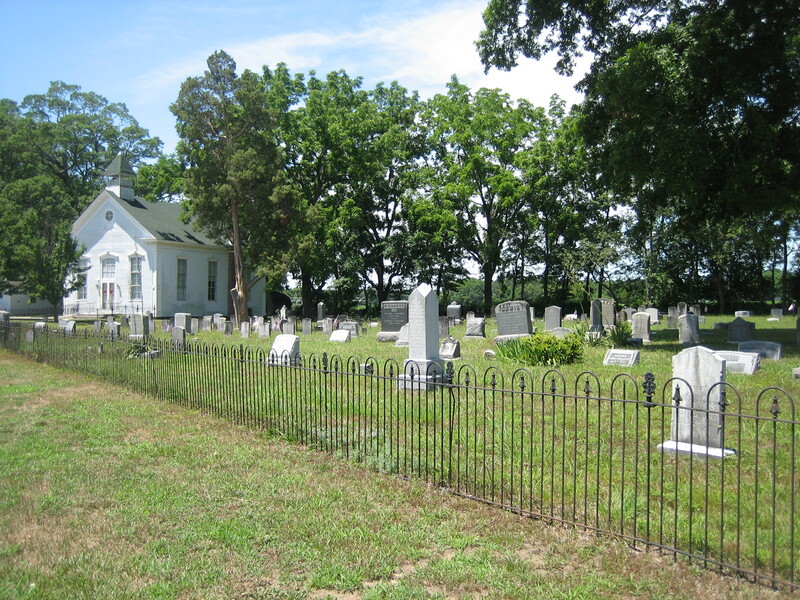 In many respects, the trip home proved of equal — though dramatically different — interest as my sojourn through Salem County. As I headed back to Philadelphia, country lanes gave way to suburban tracts and these, in turn, gave way to the gritty industrial corridor of Gloucester City marine terminals along the Delaware River. And then on to scenes of the oppressive urban poverty of Camden, New Jersey. With a poverty rate of about 10%, Salem County is no Xanadu. Yet at 44%, Camden holds the distinction of the highest poverty rate in the nation! Much like my prior trips were on main highways through Salem County on the way to somewhere else, my contact with Camden has mostly been with the small strip you pass through from the Benjamin Franklin Bridge on the way to anywhere else. Driving through Camden along the river from the south was an eye-opening exposure to block after block of raw urban poverty. 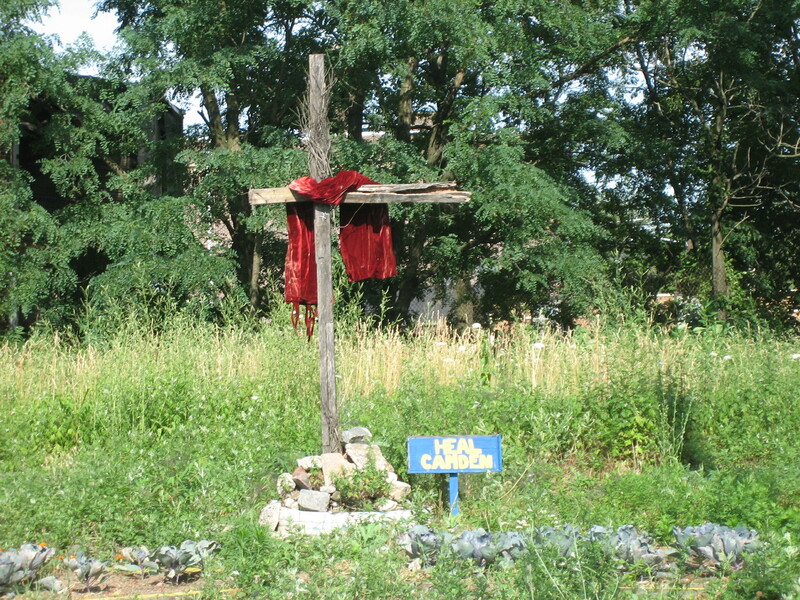 The photo above slightly obscures a small vegetable garden planted around the cross in a weed-filled empty lot. The sign reads “Heal Camden.” That sign and barren garden seemed more a cry of despair than an expression of hope. Ten minutes later I was in the comfort of my home. Here’s my Salem County farm stand haul. Back row left to right: Kirby cucumbers, red leaf lettuce, peach cider, cranberry blossom honey, peaches, dill weed and corn (yes, there was some early Jersey corn). In the foreground, scallions, apple mint and beets. All Jersey Fresh. As the week progressed, my refrigerator filled with produce without purpose. Purpose was found with an impromptu July 5th dinner I shared with my brother-in-law Larry. A short stroll on Saturday through the Rittenhouse Square Farmers Market had yielded sweet yellow “haricot vert” and a crimson sploached broad beans. These got simply blanched and drizzled with very good olive oil. There were left-over tomatoes from Maple Acres that I tossed with balsamic and cilantro. The big, fat asparagus from Sue’s Market were simply grilled and Sue’s Lancaster County corn quickly blanched. My produce “leftovers” were supplemented by a trip to DiBruno’s. DiBruno’s highlights included large, pickled Spanish anchovies — a personal favorite, a pate flavored with wild mushrooms and some sliced hard salamis. 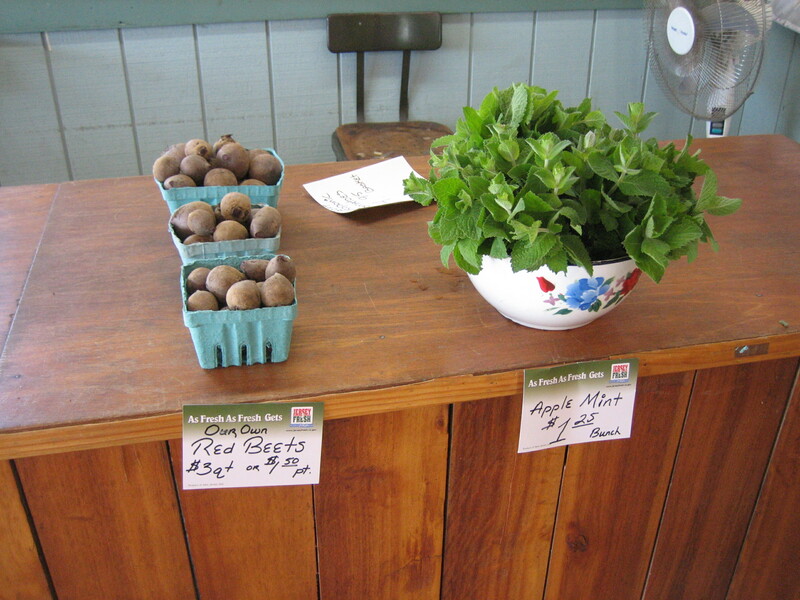 In the back right is a pitcher of apple mint tea from the bunch of apple mint I found at Weaver’s Farm Stand. Earlier in the week Weaver’s little beets became a beet and red onion salad, long-since consumed. And here are my pickles from Mr. Tkach’s farm. 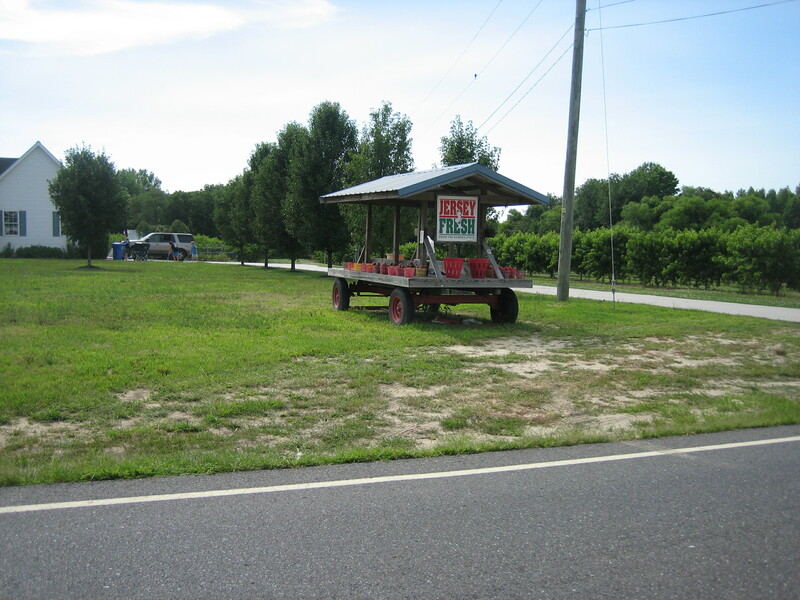 For further information on Salem County Farm Stands. This Saturday, July 10th at 2 PM I will be at Laurel Hill Gardens as part of the Second Annual Chestnut Hill Book Festival. 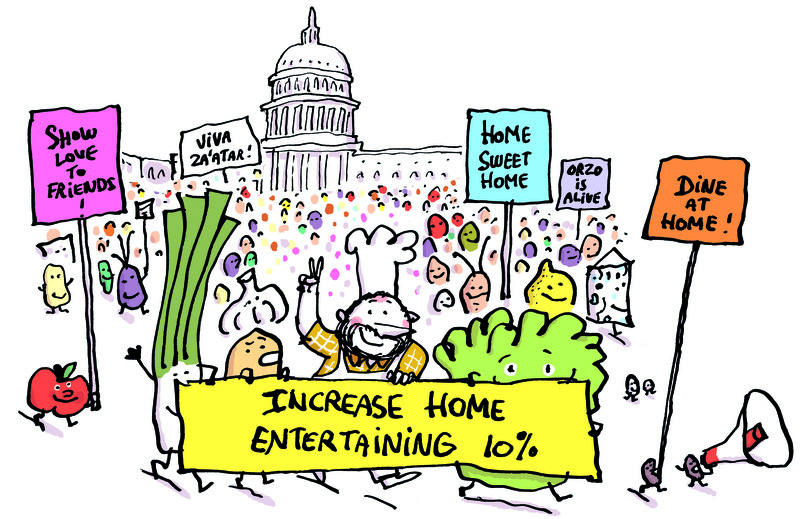 I will discuss the At Home Project and its mission to increase home entertaining. My focus will be working with fresh herbs and will include an “herb tasting,” talk about planting a backyard herb garden, working with fresh herbs as well as a recipe demonstration of fresh salsa, chermoula — a sort of Egyptian “pesto” we are currently featuring at Cleo’s Portico at The Franklin Institute and a simple herb marinade for grilling. Lots of things to taste. Of course, I will be happy to sell and sign books. Please help spread the word. Hope to see you there. Here’s wishing you a Happy July 4th weekend and hoping you spend it in a backyard with friends and family. Grilling lemons is simple to do. 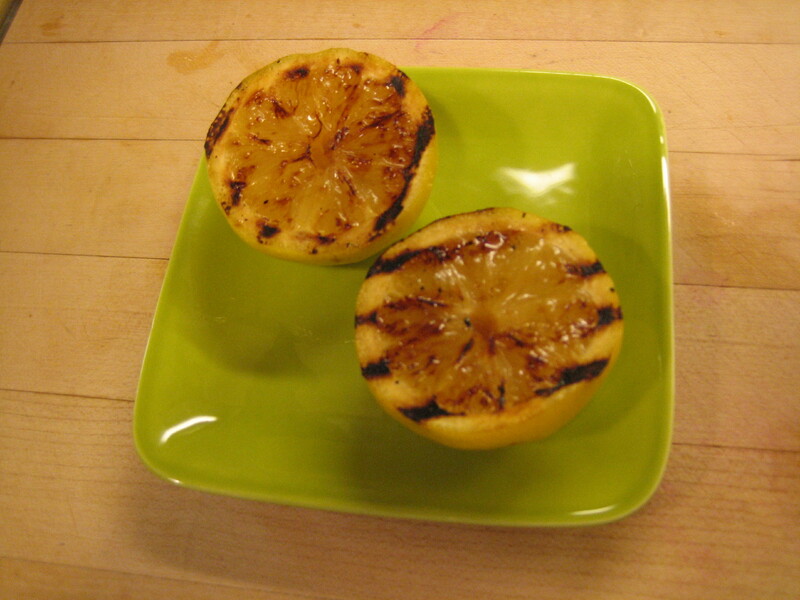 Grilling provides the tart lemon with a sweet counterpoint — the result of caramelization from the grilling. They are the perfect compliment to grilled shrimp, salmon, chicken or lamb. I did this in my kitchen for this post. It works just fine in a stovetop grill pan as well as on a backyard grill. 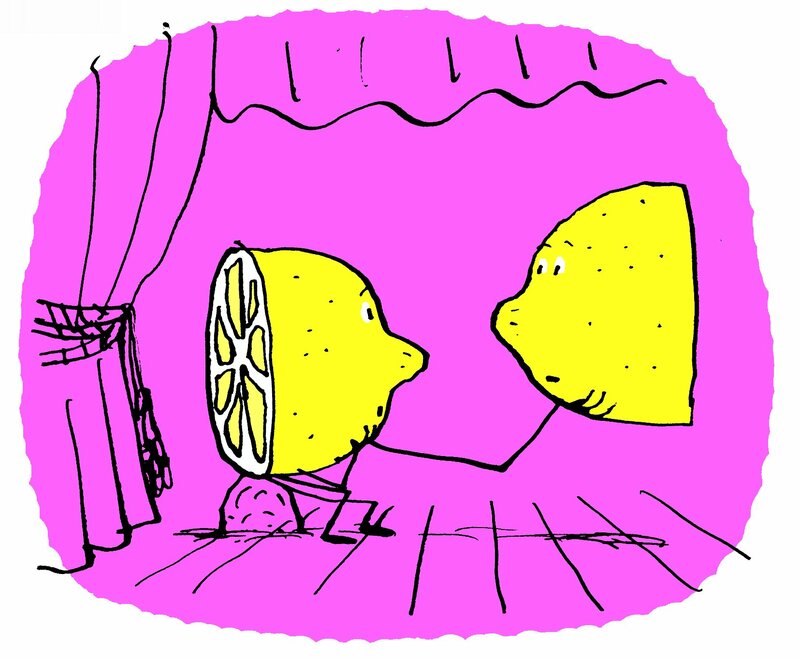 You will need just lemons and olive oil. Start by trimming the ends from the whole lemon to create a small flat surface so the lemon will sit securely rater than rocking that would result from a rounded end. Next, cut the lemons in half across the “equator.” With the point of a knife, poke out any obvious seeds. 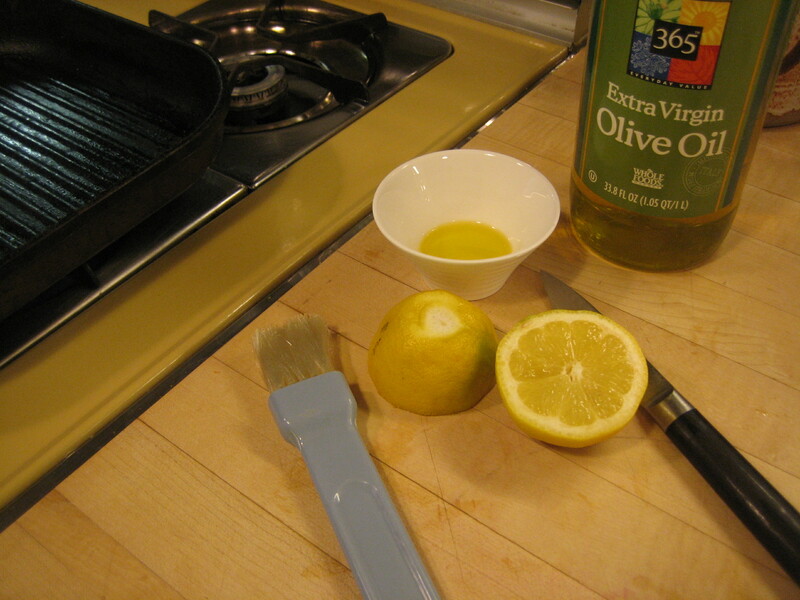 Brush exposed surface of lemon lightly with olive oil. (You can use the tip of your finger to save washing a brush. It’s easier to wash a finger tip.) Place lemon on grill over moderate heat and cook for two to four minutes — depending on how hot your “moderate” grill is — and remove. Here are the grilled lemons, good lookin’ and ready to squeeze. At Home has a very strong grill chapter that provides easy alternatives to burgers and hot dogs. See Grilled Lemongrass Chicken with Caramelized Limes — an alternative to the lemons featured here — on Page 191 or the Charred Chicken Paillards with Citrus-Cilantro Salad on Page 192 — one of my favorite recipes. Another wonderful Pascal Lemaitre illustration from At Home. Pascal is visiting from Brussels and plans to join me on Saturday, July 10th at the Laurel Gardens as part of the Second Annual Book Festival. If you find yourself on the Benjamin Franklin Parkway on the 4th, for the afternoon festival or evening concert and fireworks, I’ll be at Frog Burger — our own backyard burger stand on the front lawn of The Franklin Institute. By the way, At Home is for sale at Frog Burger. In addition to being available online, At Home is also is also available at Coopermarket in Merion where I am sure Beth is cooking up wonderful July 4th food for you to serve at home — as well as the Joseph Fox Bookstore on Sansom Street. At Home makes for the perfect gift for your host or hostess. I couldn’t resist a giant $3 basket of kirby cukes and huge $1.50 bunch of dill seed from Tkach’s. Lots of pickles are in my future. But I’ve already did a cucumber recipe so, as of now, I plan to share a recipe using the ripe Jersey cling peaches I bought — a Peach Butter scented with Ginger and Lemongrass. Wednesday’s New York Times Food Section featured Mark Bitman’s great list of 101 things to do on your grill. Here’s the link. It has been four weeks since I last posted. The reason is no lack of enthusiasm for encouraging you to entertain at home more. It is that I still have a day job. My day job involves assisting in the management of Frog Commissary — especially our efforts at The Franklin Institute. The past six weeks have been especially busy with the opening of the Cleopatra exhibit and two new seasonal restaurants that we are operating there. These restaurants are Frog Burger and Cleo’s Portico. Starting this week I will get back to more regular posts. See the end of this blog for exciting plans for summer blogging. People who remember the logo of our Frog Restaurant may remember the two dots over the “O.” It was never clear to people that those two dots represented the frog’s eyes — a very zen-looking frog. Two dots are reprising with the Frog Burger logo though we have tried to make the “eye-ness” more obvious and playful. Part of the process of planning Frog Burger was to select a burger blend. Over a period of three weeks, at four different blind tasting sessions, our panel tasted — and often re-tasted 18 burger blends. A blind tasting means that panelists were unaware of what they were tasting. Blends ranged from supermarket-sourced to blends from New York’s premium meat supplier for restaurants. From the outset I established that we wanted a “backyard” burger that balanced “bib-worthy” juiciness, texture and taste. We also wanted “back-yard” friendly pricing. Fundamental to a great burger is adequate fat content. An 80-20 blend — 80 percent meat to 20 percent fat — is the essential component of juiciness. So, all of our blends shared that component. Other components that affect taste and texture include the cuts used to make the blend and the manner of grinding the meat. Our more “exotic” blends included various combinations of skirt steak, brisket and oxtail, and, of course, chuck. Chuck is the humble foundation of most “supermarket” blends. The panel consisted of myself, James and Lydia, our Executive Chef and Sous Chef, Larry, our Director of Operations, and my son Noah, with whom I am working on Frog Burger and Cleo’s Portico. We had an occasional “guest panelist.” Our panel’s tasting sheets included columns for our three criteria — juiciness, texture and taste — and panelists were asked to rank each component of each blend from 1 to 5. At the conclusion of each session, we discussed our reactions to each blend. It was often easy to agree on what to eliminate. The poor buger usually stood out. Usually a session ended with agreement to include two or three blends in a second round. As the process continued I came to believe that the hype about special burger blends was a bit of the kings new clothes. Here was a group of pretty serious burger tasters and it was rare to find any enthusiasm for the more expensive blends. (At the end of each tasting the blends were revealed.) Occasionally a panelist would speak in behalf of some more exotic taste that we assumed to be from the more exotic side of the ledger, but it was rare to find many allies for that burger to make it into the next round. Only one of the “better blends” hunf around through the final tasting though was on no one’s top choice. At the conclusion of the process, a simple “house blend” from Esposito’s — located in the Italian Market was the winner. It was actually the second least expensive of the blends that we considered and only 60% of the cost of the fanciest blends. 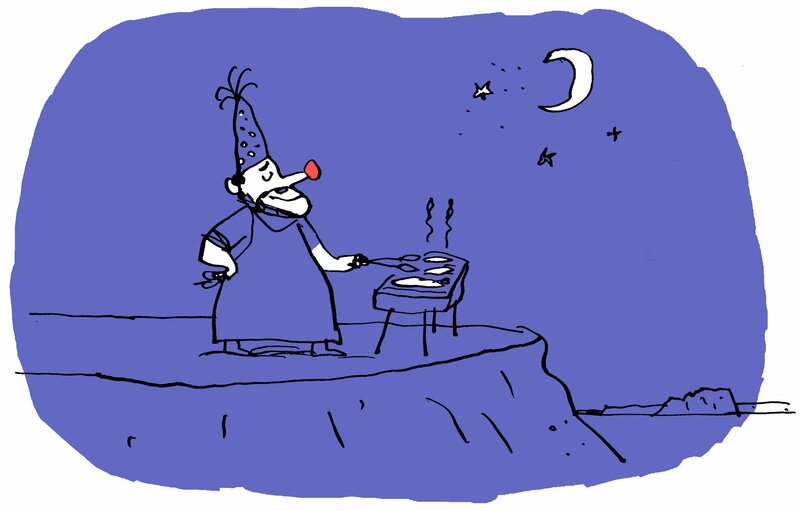 In the end, a great backyard burger has most to do with the fat content — an 80-20 blend, how you make the patty — the less you handle the meat the better the texture — a very hot fire to create a nice char on the burger — and the care taken to cook your burger to the correct doneness. At Frog Burger we cook burgers to medium unless specified. 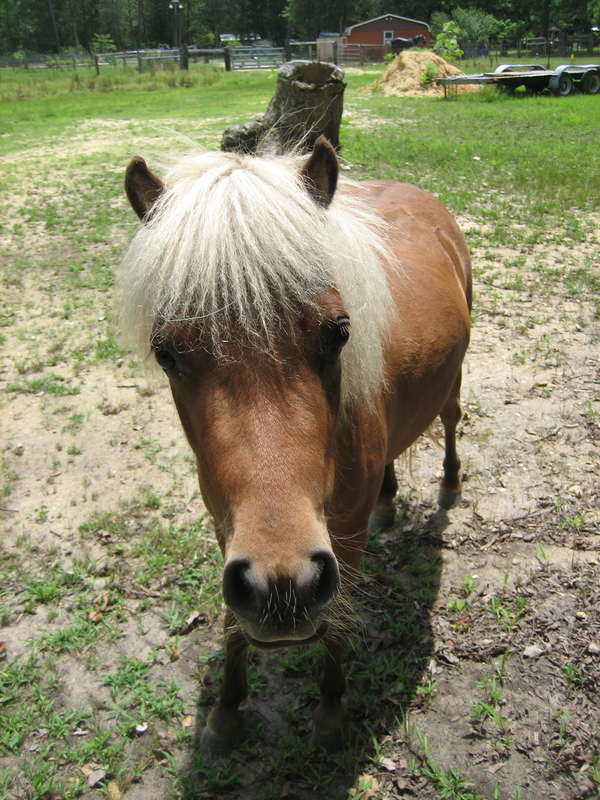 With anything beyond medium you can say good-bye to juicy. With regard to the fat content, remember that a fair amount of that fat cooks away. It is also worth the effort to toast the roll — a step many a backyard cook skips. The roll does not need to be warm so just lightly pre-toast the rolls to form a crust. The crust keeps the roll from absorbing too much juice and getting soggy. We use Martin’s Potato Rolls — often available at supermarkets. Our burgers are served with lettuce, tomato and red onion on the side. Among the burger condiments available are flame grill jalapenos and pickled red onions. The recipe for pickled red onions are featured in At Home. The recipe is from The Zuni Cafe Cookbook and printed with permission of the publisher. The Zuni Cafe is Judy Rodgers great San Francisco restaurant. Her cookbook also has her quintessential burger recipe that involves pre-salting the burger meat. Rogers’ section on The Practice of Salting Early is among the most useful cookbook advice I have ever encountered. Because I don’t have permission from the publisher beyond At Home, I can’t post the recipe here. I strongly recommend Zuni Cafe’s Pickled Red Onions from At Home for your next backyard barbecue…or visit Frog Burger the next time you are around 20th & The Parkway. Frog Burger is open daily from 11:30 AM to dusk. One last note about Frog Burger. Our “signature burger” is the LOVE Burger, a “don’t eat this too often” cholesterol-laden affair that includes a juicy burger nestled between two grilled-and-pressed cheese sandwiches — the bread and cheese fuses — and adorned with lettuce, tomato and our “special sauce” — a sort of Russian-dressing with chopped bacon — just in case you feel cholesterol deprived. Eating a Frog Burger is an amazing experience — even if you do it only once. Here’s a favorable review from today’s THE PHILADINING BLOG. Look for news about Cleo’s Portico in my next blog. On Saturday, June 26th I will be Cookstr.com‘s featured Chef of the Day. Cookstr.com is a web-based recipe source — “home of the best recipes from great cookbooks by acclaimed chefs and authors.” This is an honor and an exciting step in my efforts to spread the word about At Home. A series of At Home recipes will be featured on Cookstr.com. Check me out on Saturday. Christina and I are on our way to New York this afternoon to attend the NY Premiere of Emmanuele Phuon’s work, Khmeropedies I + II at the Baryshnikov Art Center. 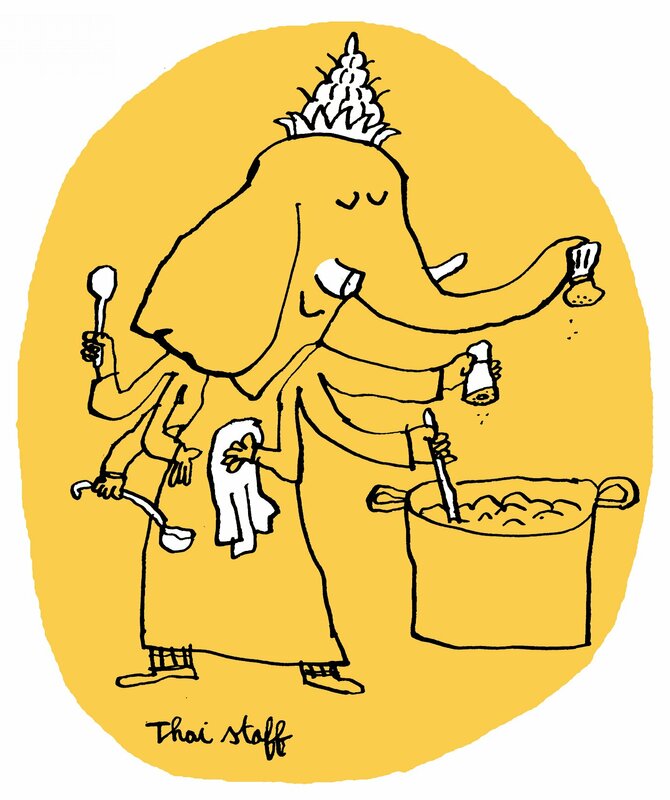 Emmanuele is Manou, dear friend and wife of At Home illustrator, Pascal Lemaitre. Read At Home’s Postscript on Page 498 to learn more about the origins of this remarkable dance performance and dance troupe. The performance will be repeated Friday and Saturday. For more information. Here’s Manou’s recipe from At Home for her Boiled Chicken with Ginger Relish & Sticky Rice. It is surprisingly refreshing on a hot summer’s eve. This is about as far from your mother’s boiled chicken as Philadelphia is from Bangkok. Manou, a friend and also the wife of this book’s illustrator, Pascal, served this to us on a visit to Brussels. The chicken is removed from the bone and served with a potent swirl of chopped ginger and garlic. Simple, humble and delicious! do ahead Chicken is best if made shortly before serving but it can be made up to two days ahead, refrigerated and refreshed in stock. 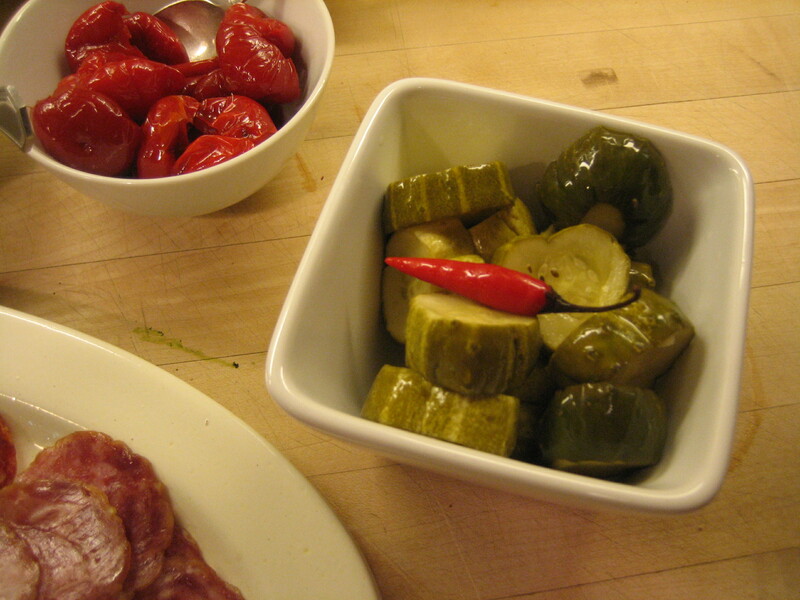 Relish can be made up to four days in advance and stored in the refrigerator. Rice should be made just before serving. 1 To cook chicken: Rinse chicken, place in a large pot and cover with at least 2 quarts water. Add sliced ginger, crushed garlic, 1⁄2 cup cilantro, chiles and 1⁄4 cup fish sauce. Bring to a slow boil and reduce heat to a simmer. Add back water as needed. Cook until meat falls off the bone, about 90 minutes. Remove chicken from pot and allow it to rest until it’s cool enough to handle. Remove skin and pull meat from bones, discarding bones. Skim fat from stock and set aside. You will use stock to make the relish and rice and to refresh chicken, so save at least 7 cups. 2 To make relish: In a small sauté pan, heat oil over moderate heat. Add cubed ginger and garlic and gently sauté to soften without browning, about 3 minutes. Add 3 tablespoons fish sauce and 1⁄2 cup reserved stock. Cook over moderate heat until liquid is reduced to a glaze, about 5 minutes. Set relish aside to cool. 3 To make rice: Rinse rice well in strainer until water runs clear. In a pot, combine rice with 41⁄2 cups reserved stock. Bring to a slow boil, cover, and reduce heat to very low until all water is absorbed, about 15 minutes. Allow to sit for 10 minutes before serving. 4 To serve: If chicken and stock are still warm, place chicken on platter and pour a little stock over it to moisten. If you cooked chicken well in advance and it is now cold, refresh chicken in a pot with stock over moderate heat until just warm. Add salt. Garnish with scallion and remaining cilantro leaves. Serve with relish and rice on the side. 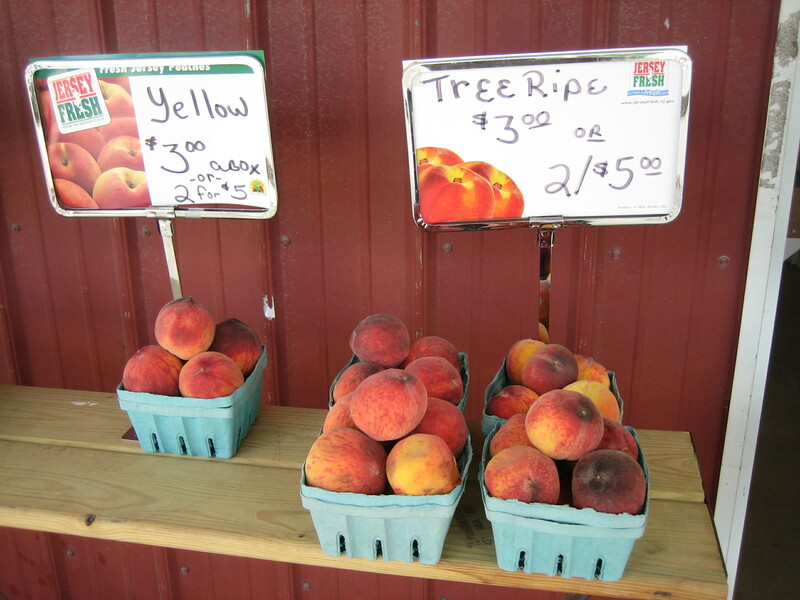 Many of this summer’s blogs will focus on weekly visits to area farm stands and farmer’s markets. Though not a locavore zealot, I am a strong believer in using locally grown produce. Summer though early fall is the time to incorporate trips to your local farm stand or farmer’s market into your At Home plans. So, each week — more or less — I’ll visit another place and create a new recipe for the At Home blog. My posting will begin next week at Maple Acres Farm located in Plymouth Meeting. Followers of At Home will be familiar with Maple Acres. I particularly love the variety of eggplant available at Maple Acres and will provide you with an easy recipe for grilled eggplant. Please help me identify farmer’s markets and farm stands to visit. I am looking for suggestions with 50 miles of Center City Philadelphia. 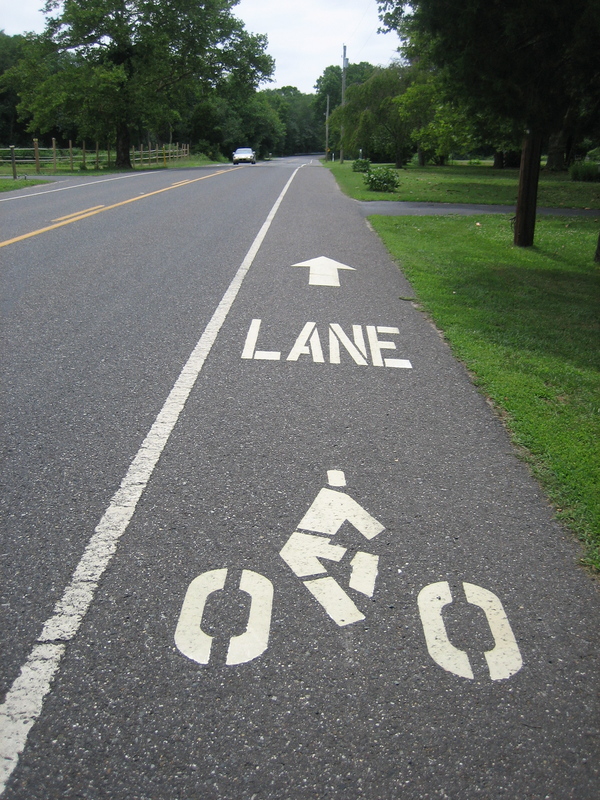 Post your suggestions in Leave a Comment at the end of this At Home blog. This past Saturday I appeared at Uncorked — a food and wine festival held at Staten Island’s Historic Richmond Town. The festival was a wonderful celebration of the bounty of Staten Island restaurants. Uncorked is the brainchild of Pam Silvestri, former caterer and food editor of the Staten Island Advance. Tents were spread around the grounds of Historic Richmond Town where guests grazed from delicious taste to taste. In addition, events included a session on food photography by New York Times photographer Andrew Scrivani, two sessions of Cheese School where students learned about cheese and wine pairings as well as food demonstrations. Demonstrating chefs included Staten Island chef Julian Gaxholli, Food Network star and cookbook author Daisy Martinez plus yours truly. The subject of my demonstration was the Under-appreciated Chicken Thigh. I talked about At Home’s principles and demonstrated three recipes from At Home — Thai Thighs, Za’atar Marinade — also for chicken thighs — and Sweet & Sour Slaw. Just as I was about to grill the twenty pounds of Thai Thighs — plus three pounds of Za’atar thighs — that I brought, I discovered that their grill was out of gas. I suggested to the audience that they return in about 25 minutes — time enough to locate a fresh gas tank and get the grilling started. With the able assistance of three Staten Island Good Samaritans — a sister and two brothers — a hundred plus still hungry Islanders enjoyed Thai Thighs and Sweet & Sour Slaw. My hope was that I uncorked something new on Staten Island. I recommend Thai Thighs and a slaw as a welcome change to Memorial Day burgers. Chicken thighs pack far more flavor than breasts and are much more forgiving of overcooking. They take to the grill particularly well. Given their low price and myriad assets, they’re pitifully underutilized. The sugar in this marinade makes for an extra level of caramelization-and a messy grill. You can also use any of the marinades in this chapter and follow the marinating and grilling procedure above. do ahead Thighs can be marinated up to three days ahead. It’s best to cook them the day you are serving them. 1 Cut the root tip and dry end of the lemongrass stalk, leaving a length of about 8-10 inches. Peel away the outer leaves, leaving the tender core. Finely chop. 2 Combine lemongrass with ginger, garlic, chiles, lime juice, sugar, fish sauce, oil, salt and pepper and mix well. Add chicken. Toss well and refrigerate for 2-3 hours. 3 Just before grilling, add oil to marinade. Preheat grill to medium-high. Remove chicken from marinade, and allow marinade to drain off, but don’t wipe it dry. Place chicken on grill, smooth side up, and grill until nicely charred, about 4 minutes. Turn and grill the other side, about 4-5 minutes. Serve whole or thinly sliced, either hot or at room temperature. Serve with lime wedges. Tear cilantro and sprinkle it over the chicken. do ahead Marinade can be made up to three days ahead and stored in the refrigerator. Combine lemon zest and juice, garlic, thyme, za’atar, salt and pepper in a bowl. Mix well and let sit 5 minutes. Stir in olive oil until incorporated. This year-round slaw is simple to make. The touch of olive oil just adds a little glisten and can be skipped for a fully fat-free slaw. It pairs well with burgers and grilled chicken or pork chops. You can also add a julienned apple to the mix. do ahead Slaw can be fully made up to a day ahead. As slaw sits, the cabbage will wilt and render water. This decreases the total volume and thins the dressing some. Re-toss before serving. 1 Cut cabbage in quarters. Remove the core and discard. Set cabbage flat side down and finely slice. Place cut cabbage in large bowl. Pick through to find any thick pieces and slice them. 2 With a box grater or the largest holes of a food processor attachment, shred carrots. Combine cabbage, carrots, scallions, dill and parsley. In a separate bowl, combine sugar, cider vinegar, salt and pepper and stir well to dissolve sugar. Add olive oil. Pour dressing over vegetables. Cabbage should sit in dressing for at least 20 minutes before serving. An Uncorked attendee shared with me the challenge of finding ethnic ingredients on Staten Island. It seems they are few and far between. But this very same person pointed me to a “Russian” grocery store just down the road from Uncorked. Never one to pass up an interesting ethnic market, I visited Net Cost. 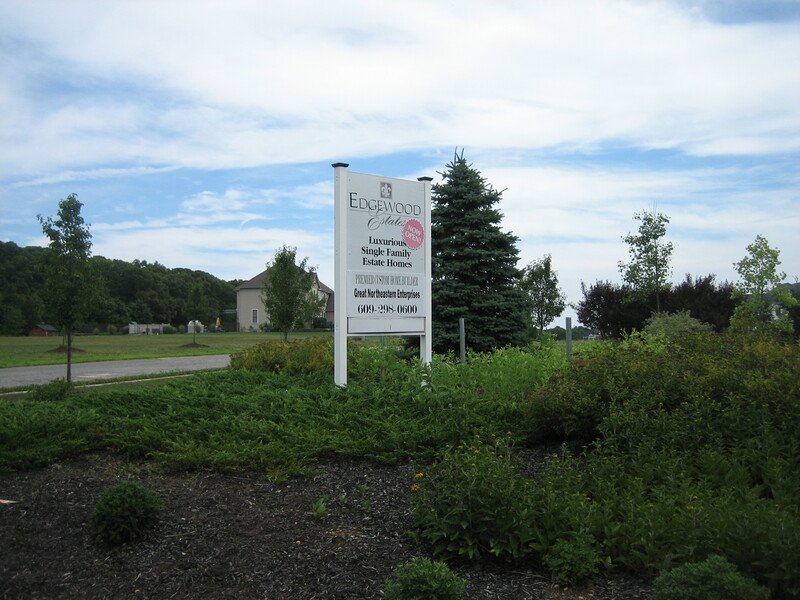 There are Net Costs in the New York area and one in Northeast Philadelphia. Visiting ethnic markets is akin to traveling to far away places — except you get there faster. Walking into Net Cost I knew I was not in Kansas any more — no less Staten Island. The aisles were filled with foreign speaking people and the shelves were filled with all manner of what for me were exotic products and what for the shoppers was a taste of home. Earlier in this blog I suggested Thai Thighs as a welcome alternative to Memorial Day burgers. Well…do I have some Memorial Day burgers for you! This Saturday we open FROG BURGER, an outdoor burger stand featuring “flame-grilled backyard flavor” on the front lawn of The Franklin Institute. (Frog Commissary provides all of the food service at the Institute.) Frog Burger is the first of a one-two punch with Cleo’s Portico — offering light dining and drinking overlooking the Benjamin Franklin Parkway — the following weekend in conjunction with the opening of the Cleopatra exhibit on June 5th. Here’s a link to a Philadelphia Magazine blog about FROG BURGER. In particular, look for news in the Philadelphia Magazine about the soon to be notorious “Love Burger” — a creation of my son, Noah with whom I am working on FROG BURGER. FROG BURGER has been consuming over the past several weeks which accounts for a diminished number of At Home blogs. More details about FROG BURGER to follow. Here’s our logo. You can find me this Memorial Day weekend on the front lawn of The Franklin Institute. By the way, At Home will be available for sale at FROG BURGER. If you need a house-gift to bring to your Memorial Day picnic, stop by FROG BURGER and pick-up a copy of At Home. 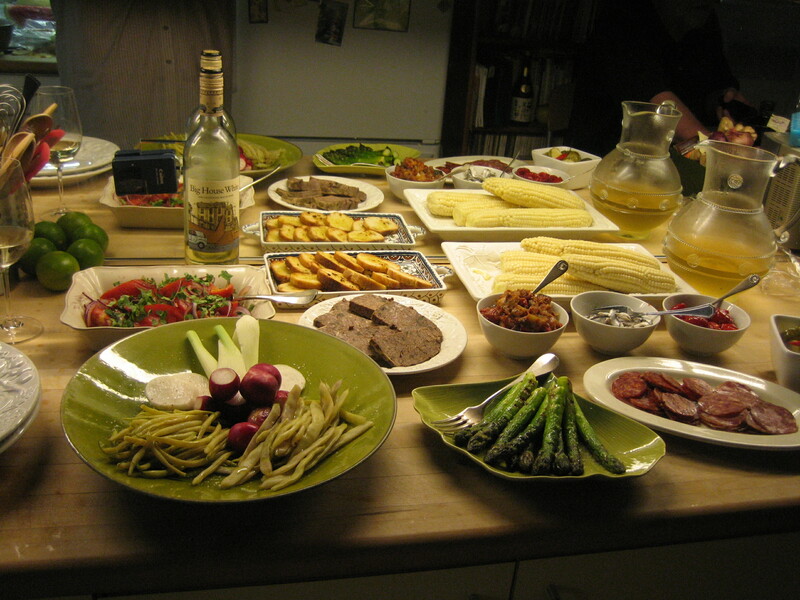 And if you are looking for something new for your backyard Memorial Day, look no further than At Home‘s Chapter 8: From the Grill and Chapter 13: Room Temperature Accompaniments. Happy Memorial Day. I hope you spend lots of time at homes! Toward the end of our Sunday evening gathering with friends, the subject of New Year’s resolutions came up – specifically, the curious lack of anyone actually making resolutions this year. 2009 was a troubling year. At its start, it seemed as though the very economic basis our of our lives was threatened. We swore in a new president who filled us with hope and it quickly became clear how complex and overwhelming a job he had. Locating America’s place in a changing world, extending health care without bankrupting our nation, expanding foreign wars, climate change, a daunting national debt plus the overall rancor in our national dialogue, all conspire to drive out hope. And Christmas Day brought not just Santa, but a near miss from a terrorist’s underwear bomb. So perhaps just reaching year’s end was enough. Though the sun may not be shining, the sky did not fall. 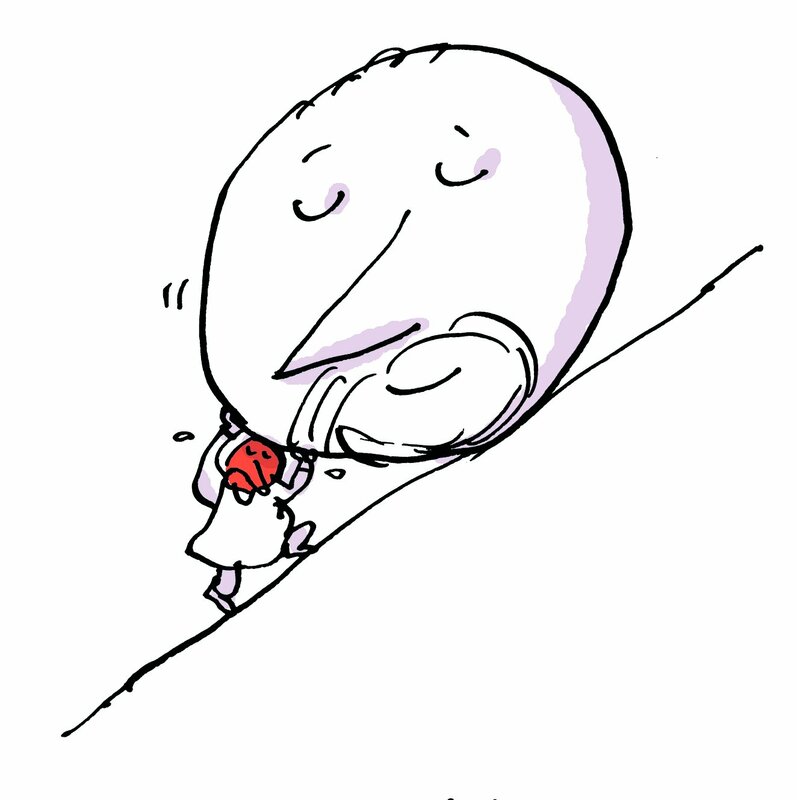 Resolutions call for a confidence in the future – an “if, then” belief. If I do this, then that will happen. If I work hard and make responsible choices, I’ll be OK. It turns out, not always. In addition to the beginning of a year, we are at the start of a decade. For baby boomers like myself, in this decade we will pass the torch and with that passing, an inevitable question: What have all these years of resolutions added up to? What is the legacy we pass on to our children? So here we are. Are there resolutions worth making and fighting for? I don’t know the answers to many of life’s questions. But I do promise you that friends and family are enduring. I promise you that if you entertain more at home, you will have a richer connection to friends and family. I also promise to work, through my blog and At Home and At Home Online, to help you fulfill your resolution for…More Parties. Better. Easier. Best wishes for many delicious moments this year…At Home. I have a wonderful and bright (as in smart and sunny of disposition) new assistant named Britt. Britt was one of those Craig’s List miracles — an apparent random choice that resulted in a match seemingly made in heaven. Britt’s mother related to her the day Commissary Carrot Cake sent her into labor with her brother. Stories abound at the intersection of my past forty professional years and the lives of many. One of the joys of sitting in Reading Terminal Market selling At Home is the stories related to me by the many people who stop to chat. Over the years thousands of young people have worked for me. It is especially gratifying to hear of stories of how careers connected to food blossomed from seeds planted in our kitchens and restaurants. One visitor this weekend related the direct line from teenage baker’s assistant in The Commissary to food editorship of a major metropolitan newspaper. It is the familiar cover of The Frog Commissary Cookbook that is what catches the eye of Reading Terminal passers-by. Frequently this leads to a re-counting of the well-worn condition of their well-used copy of my original book. It seems like a fair proportion on Philadelphians have such a copy. Here’s a favorite: “I have two very worn cookbooks. One is Julia Child’s and the other my Frog Commissary Cookbook.” Now that’s pretty good company! I tell people At Home is The Frog Commissary Cookbook with twenty-five years more experience. Then there was the “International Cookie Tasting.” A table visitor related how, in her search for the perfect oatmeal cookie, she carefully selected and baked from four recipes. She sent the cookie samples around the country to scattered friends — including one in London, thus “international.” Being friends, they dutifully filled out and returned the enclosed evaluations. The winner – hands down — was from The Frog Commissary Cookbook. One table visitor recounted how a friend from far away heard me on Radio Times last Wednesday, which reminded her of Philadelphia and her long forgotten friend. This lead to a call — after ten years. Very sweet. If you have similar memories –career choices, first dates at The Commissary, marriage proposals at Frog, family outings and occasions — please share them with me and others as comments on this blog. As book owners know, running along page bottoms where short recipes permit are short notes where I share my own memorable moments. This note is about my meeting my wife, Christina. Sunday, November 29th was Christina’s and my first anniversary. After our wedding we went to Congress Hall in Cape May for a brief honeymoon. That’s where we are this Monday. On a June Saturday we catered a small wedding luncheon for Lenni and Perry at the Rosenbach Museum and Library on tree-lined Delancey Place. Lenni was an old friend who had testified on our behalf at the Pennsylvania Liquor Control Board license hearing for little Frog in 1973. The first course was the pea soup with beet heart described on page 109. A spectacular lobster salad followed, making for a lovely luncheon. The next day, Lenni and Perry held a party for their “B-list” at El Vez, a stylish Tex-Mex restaurant. I was on the B-list. Normally, I wouldn’t have gone, as I’m more interested in working behind the scenes than attending big parties. But a wedding planner who had helped with Saturday’s luncheon was also invited, and she was a friend, so I decided to drop by—a life-changing decision. It was at El Vez—amidst margaritas and mojitos, nachos and enchiladas—that I first saw Christina. 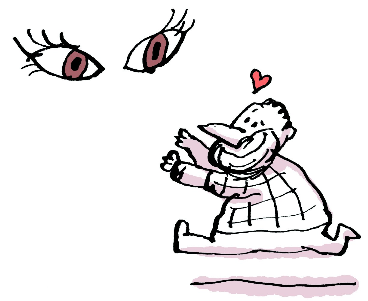 As she would soon tell me, it was not actually the first time we had met. Our prior meeting was in Lenni’s backyard, where I was cooking on the very best gas grill I ever cooked on—a near-religious experience, from which even Christina’s amazing eyes could not distract me. But at El Vez, it was all apparent and captivating: the eyes, the smile, and, of course, the wit and charm. She told me that Don and Frog Commissary had almost catered two of her almost-weddings. By New Year’s Eve we were engaged. Setting the date proved to be a longer process, but Frog Commissary would finally get to cater a Christina wedding.